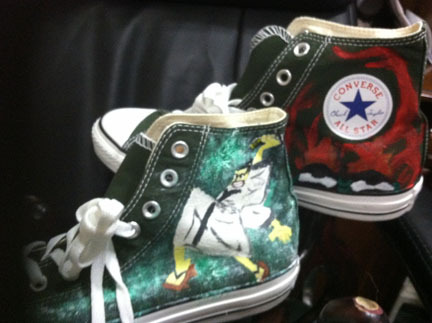 Project Fiver: Chucks for Fiver - Back for 2013! Chucks for Fiver - Back for 2013! Chucks For Fiver is back for 2013!! I'm still waiting on confirmation on a few details from the DragonCon staff, but I thought I'd get everybody thinking about the Chucks. I have a couple of pairs of late entries from last year, and I'm going to put a few up on eBay for everyone to bid on! 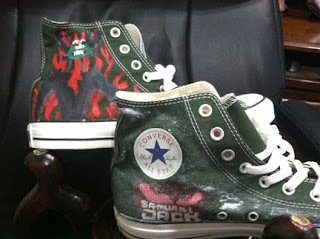 This wonderful pair of Samurai Jack Chucks is made by Frances, who is a friend of Nikki. I don't have her website up yet, but she did a really great job on these!